Students who are willing to get into Birla Institute of Technology and Science (BITS) Pilani have to crack the BITSAT exam. Every year, approximately 70K students appear for BITSAT and want to crack it with a ‘Good Rank’. And of course, if you want to crack BITSAT entrance you must need to be prepared for it before hand. Start with the aspects of this exam i.e what is the syllabus, what are the exam patterns, and the most important chapters which you should pick up first as to prepare. 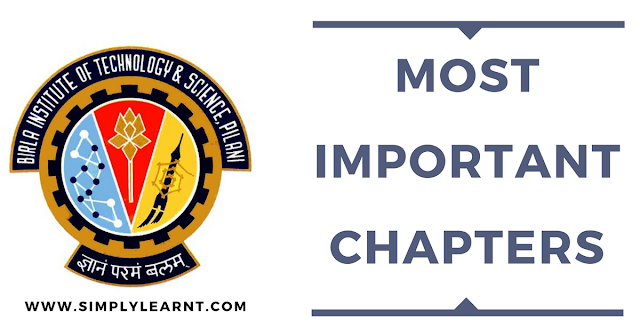 Check out the below-mentioned list of the chapters which are the most important (Do or Die) chapters of all subjects (Physics, Mathematics, Chemistry, Logical Reasoning and English Proficiency). It’s better not to skip these chapters while preparing for BITSAT. Tip #4 - After completing a chapter of any subject, we recommend you to use Good Enough Meter (GEM) to analyze your performance for that chapter. As you revise chapter with our study material and practice questions in our question bank, your GEM score changes. When it reaches GREEN, you have prepared that chapter well. We hope the information provided above for the most important chapters of BITSAT will help you in preparing for BITSAT exam.